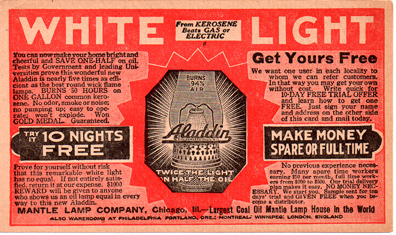 The Aladdin model 11 lamp is virtually identical to the late model 9 and model 10 lamps. The burner assembly is the same except for the labeling on both the wick raiser knob and flame spreader. There are three versions of the flame spreader labeling. Like the model 10, the model 11 appears to be purely a name only update for sales purposes. See Model 9 for burner and font pictures. There are slight variations in the table lamp fonts between the model 9 through 11 lamps that are not noticeable without a close side by side comparison and a ruler. These variations are thought to be mostly due to tooling wearing out and being replaced. Table - Finish: Nickel plated. wick cleaner: skirted type with straight bottom. Labeled "WICK CLEANER"
There were three versions of flame spreader. The name was changed from generator to flame spreader in 1928 between model 11 and model 12 production. Generators were supplied on the model 11s during production. 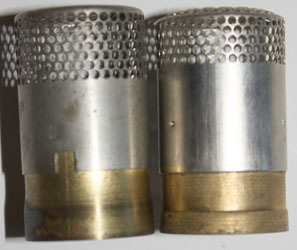 Flame lame spreaders are replacement parts available to keep model 7 through 11 lamps functional after 1928. New replacement flame spreaders were sold in a cardboard tube. 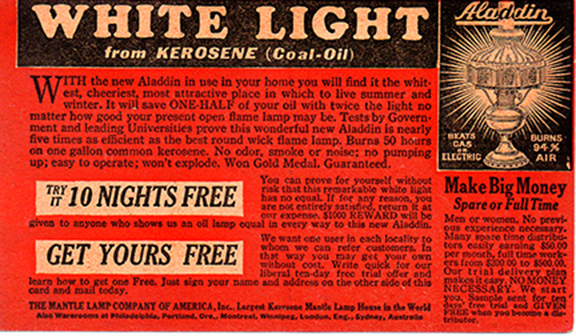 LEFT: This is a 1923 advertising postcard that offers both a 10 night free trial on a new lamp and an opportunity to become a door to door Aladdin lamp salesman. Door to door salesmen demonstrating lamps accounted for a very high percentage of Aladdin lamp sales. Interesting things about this postcard is that the illustration shows a model 4 or earlier lamp gallery and that they are still using the blue ribbon won for the best kerosene lamp in the 1915 worlds fair in San Francisco. 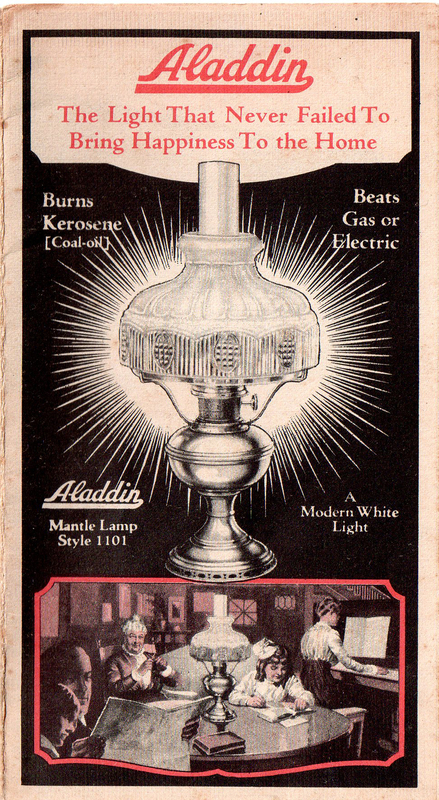 BELOW: 1924 advertising post card that offers both a 10 night free trial on a new lamp and an opportunity to become a door to door Aladdin lamp salesman. This one has been updated to show a model 11 table lamp. See model 9 for burner and font pictures. Mantles: Production of Aladdin KoneKap mantles ceased in 2007. 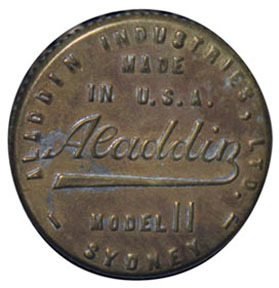 In 2012 Aladdin introduced an adapter that fits onto a model 3 through 11 gallery that allows the use of a Lox-On mantle with the earlier lamps. Wick: The model 11 wick can be used in model 7 through 11 lamps. Gallery: The model 7, 9, 10 and 11 galleries can be used. Generator: Model 7, 8, 9, 10, and 11 flame spreaders can be used. The model 11 flame spreader was discontinued in 1955. Burner: Model 7, 8, 9, 10, 11 and 12 burners can be used with this lamp.